Sunleigh leads a group of racers including Danneskjold (with skull and crossbones) and Action (to right) past West Dog Island bound for the finish line of the final race. 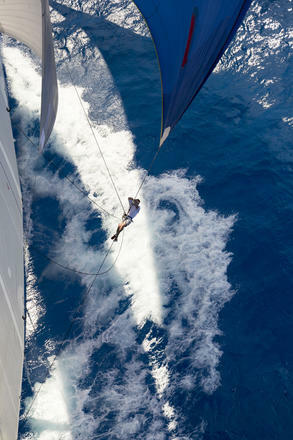 The A2 spinnaker on Danneskjöld blankets the cockpit of the 105-footer as the crew scrambles to take it down. 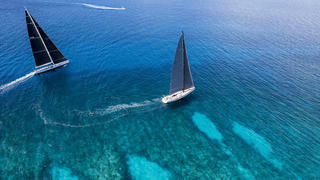 Grande Orazio leads Ammonite into the first turning mark in the final race of the Loro Piana Caribbean Superyacht Regatta & Rendezvous. 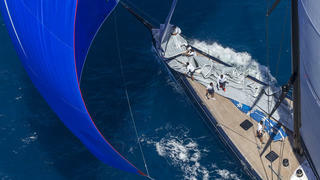 The 146-footer Ganeshastrikes a reaching pose on an azure sea. 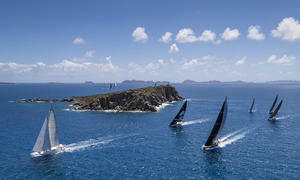 A fleet of superyachts navigates through the lee of West Dog Island. The crew of Wild Horses lives up to their boat’s name during a light moment in the final race. 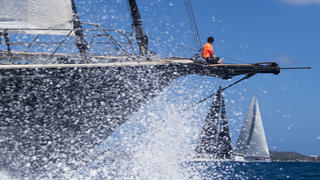 A Rebecca crewman is hoisted to the clew of the gennaker to change a sheet during the race around Virgin Gorda on day two of the Loro Piana Caribbean Superyacht Regatta & Rendezvous. Ningaloo’s crew takes a wave over the bow as she rounds the top of Virgin Gorda. 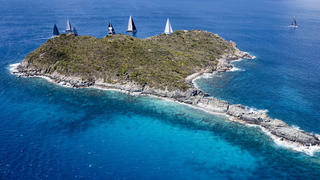 Grande Orazio(right) tacks to cover B5on the crystal clear waters off Virgin Gorda. Leopard 3’s bowman helps feed a roller-furling unit to the bowsprit as a wave takes aim to douse him. 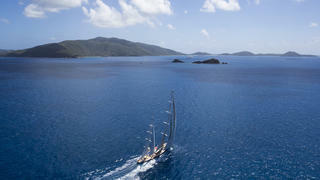 Rounding the top of Virgin Gorda was a wet and bouncy affair, as the crew of Q found out. 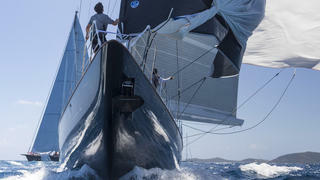 Rebecca strikes a classic pose on an azure sea during the first race at the Loro Piana Caribbean Superyacht Regatta. To catch up on all the action from the first day's racing don't miss our highlights video. 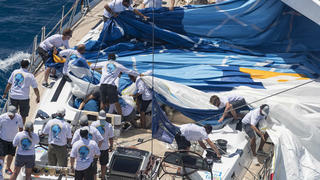 The bow team on Action works to set the spinnaker after rounding the windward mark during Race 1 of the regatta, which took place under perfect blue skies. The new Swan 115 Shamanna shows a clean foredeck after rounding the windward mark during the race which saw the entire fleet race over a distance of nearly 30 nautical miles. 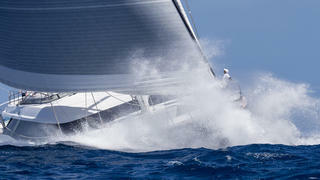 The crew of Leopard 3 enjoys a beautiful day’s sail which took place in a fantastic wind of 10 to 15 knots. 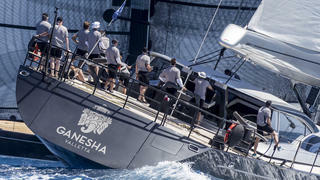 In a key moment of their race, the afterguard of Ganesha watches P2 cross on starboard near the second passing of the Dog Islands. 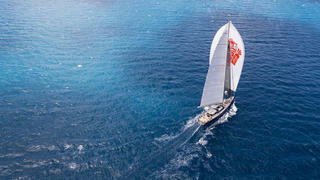 Few seats offer a better front row view of the Loro Piana Caribbean Superyacht Regatta than the bowsprit aboard the 60 metre Perseus 3. 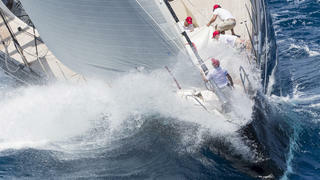 To see more of the best pictures from the regatta visit Boat International's media bank. 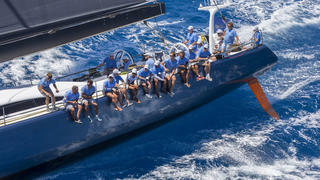 Few seats offer a better front row view of the Loro Piana Caribbean Superyacht Regatta than the bowsprit aboard the 60 metre Perseus 3. 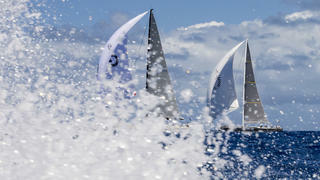 To see more of the best pictures from the regatta visit Boat International's media bank.